Inside, he might see Sarah in her poor excuse for a disguise talking to the three men. Sean laughed. "It means you are descended from a people that Nikidia and Marsada want you to forget." He tells her, and starts searching his bag. The guard turns to him. "Use of the enemy's coin is helping zeir economy. Zat's something zat you don't do in war." "War? Isn't that another word for negotiation? My friend you have a lot to learn about the big wide world...but one thing to know is that a complete conquest is earned to forced." "I'm glad to meet such a soldier like you. You could call me Blud Beard, Captain of the Bloodmoon Devils." He pulls out a flintlock pistol, loading it in a rapid motion. "I'll be honest, you caught me off guard for a moment. I forgot to load all my pistols this morning. Eh, one shot at close range ought'a do it." Hans whips around, weapon at the ready. "Settle down!" Sarah tells Hans. "An' just a bit." She tells Moenir as she turns back to Sean. "Explain. Now." The soldier sneered. "One shot's loud enough to alert ze whole town, echo-y as ze walls are." He says. "You'll have ze whole guard on your tail." Ryko, startled, aims a pistol at Moenir. "Who're you?" He asks gruffly. "A friend. Don't worry." Sarah told him as Sean set a map on the table. "Anything look off to you?" He asked the group. "You're right about that, but think about this. If a guard is killed in open day light, it will give whatever reason you're still being as harsh a fighting spirit. Guessing from circumstance, it would set ablaze a revolution. I love soldiers like you, so easy to give your lives away. It makes it so easy to play with you." "Plus I'm a pirate, it's kinda in my nature to run, so I will run and I won't stop. If anything, shooting you right here is a win-win for me." "Moenir, I'm a part of this rebellion...recruited yesterday." "Did they take take Darsa already?" OOC: that embarrassing moment where you forgot you were the most recent person to post and reply nearly double posting. He turned to Moenir. "Sorry about that. I've been on edge lately, what with the Nikidians invading and the like." He looked at the map. "No, but they're close." He replied, speaking of Darsa. Blud might catch a the guard's glance to behind Blud. "They skipped over Darsa." Hans whispered to Moenir, his slight Imillian accent present underneath the Marsadan influence that was also hearable. "Heading west, not thinking we'd be any trouble to them." Sarah stared at the map. "...Kena?" She asked. 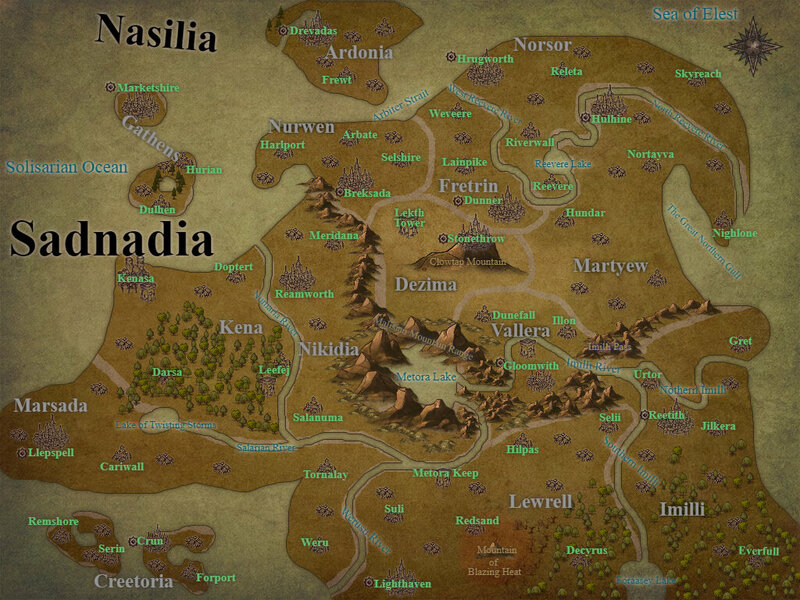 "If there was a country that big 'tween Marsada an' Nikidia, what th'hell happened to it?" "The Great Truce." Sean told her. "The only time in recorded history the two ever worked together." "So... We planning to take down Nikidia as a whole, or just get them out of town? Right now, both seem fairly unlikely unless we can get a good grip on the situation here, and maybe get something going in Darsa as well." Ryko fingered the vial with the swirling, dark black mist inside. "The plan was to get them out of town and restate Marsada." Sarah said. "But that's something you should reconsider." Sean said to her. "Return Kenasa to her rightful people." "But how?" Sarah asked. "An' again, how did Kena get beat that hard?" OOC: I know it's kinda hard to see, but the Nikidian border to Kena is on that one river. "Right... but who's to say they won't come back?" Ryko replied. "More of you eh? Explains your confidence." "You'll need a stable gold supply to run a country. I can promise good word to several high marks in Gathens. I know some names over there, that could help." "I haven't got that far!" Sarah snaps at him. Sean takes a step back. "Anyways..." He continues. "Kena wasn't a military powerhouse like her neighbors, but instead a cultural one. From the great nation came many great authors, artisans, and architects, among more." He said. "Speaking of architects, their distinct building style was actually almost wiped out during the supposed "modernization" of the formerly Kenan cities, but thankfully at least Kenasa was spared. But that's a bit of a tangent." He admits. "Anyways, both Marsada and Nikidia were jealous of their culture and prestige among their near neighbors, so...they made a truce. And, in doing so, attack the borders of an unprepared Kena, who was defeated in a matter of weeks." He says sadly. "The one city that lasted the longest was this one, Kenasa. It lasted three days on its own, but it fell when attacked from both sides. However, neither wanted to give up the capital of their conquest to the other, so war between them started back up almost immediately over who would get it, and...well, you know the rest." He finished. Sarah was silent, taking in all of what she just heard. The soldier stumbled back, and Blud would see Jacques standing behind him, pistol aimed at Blud's head. "My my, what a way to start ze day: wiz a hostile attack in an inn we only planned on peacefully updating to ze current law. Tell me, are you a traitor or a thief?" He asked, gesturing to his hat. Ryko chuckles good-naturedly, before examining the map further. "I wish we could offer the countries something they wanted... besides Kenasa." he muses. "They wouldn't be satisfied." Sean muses. "Sadly, they never will. We just need to take back our land." He said. "But how to do that..." He wonders. Hans speaks up. "What about getting outside help?" He asked. "From other nations, and from the other cities that used to be part of Kena?" Sarah's eyes light up. "...That's...that's not a bad idea..." She says. "That's not a bad idea... but how would we win them over?" He massaged his temples. "So many factors, so many unpredictable things..." He moaned. Asher watched the conversation, taking in all the information. "Clearly you missed the part, when I said was a pirate, and to be more specific the pirate Blud Beard." "I kill who I please, and I most certainly do not please who I kill." "How much do you want to bet that I have already loaded this one? It's a 1 out of 5 chance that I'm at least right, or who knows maybe I'm bluffing and I fired my only shot?" "I could try to get funding from some names in Gathens. It would at least help run a revolution. Plus leverage for more outside help." "And I might be able to try and get help from Imilli, though I'm not sure if it'll work." Hans adds. "Perhaps you missed ze pistol in your face." Jacques reminded Blud. "Too much politics..." he muttered. "I'm taking a walk." he exited the house, flipping up the collar of his trench coat to (somewhat) disguise himself.